Born in Wessex, England; died at Heidenheim, Germany, on December 18, 761. ST. RICHARD, the English-Saxon king, seems to have been a prince of Westsex; for he was related to St. Boniface, and set out on his pilgrimage from Hamble-Haven in that country. It is thought that he was one of those princes who ruled in part of that kingdom, till they were compelled to give way to King Ceadwall. 1 God blessed him with three children, St. Winebald, the eldest, St. Willibald, who died bishop of Eystadt, and St. Walburga. St. Richard leaving his native country, took with him his two sons, and embarking at Hamble-Haven, landed on the coast of Normandy, and visiting all the places of devotion on his way, travelled into Italy, intending to go to Rome: but at Lucca fell sick and died about the year 722. His body was buried in the church of St. Frigidian, 2 and on account of certain famous miracles wrought at his tomb, was taken up by Gregory, bishop of Lucca, by the pope’s authority, and is kept in a rich shrine in that church. His name occurs in the Roman Martyrology on the 7th of February. SS. Winebald and Willibald accomplished their pilgrimage to Rome. After some stay there to perform their devotions, St. Willibald undertook another pilgrimage to the holy places in Palestine; but Winebald, who is by some called Wunibald, who was from his childhood of a weak sickly constitution, remained at Rome, where he pursued his studies seven years, took the tonsure, and devoted himself with his whole heart to the divine service. Then returning to England, he engaged a third brother and several amongst his kindred and acquaintance to accompany him in his journey back to Rome, and there dedicate themselves to God in a religious state. St. Boniface, who was our saint’s cousin, coming to that city in 738, prevailed with him upon motives of charity to undertake a share of his labours in the conversion of the infidels and in founding the infant church of Germany. Winebald accompanied him into Thuringia, and being ordained priest by that holy archbishop, took upon him by his commission, the care of seven churches in that country, especially at Erfurt, as the nun informs us in the life of our saint. These churches the chronicle of Andesches and Bruschius call seven monasteries; but without authority or probability, as Serarius observes. St. Willibald was made bishop of Aychstadt in Franconia in 781, and being desirous to erect a double monastery which might be a pattern and seminary of piety and learning to the numerous churches which he had planted, prevailed with his brother Winebald, and his sister Walburga, whom he invited out of England, to undertake that charge. Winebald, therefore, translated his monastery from Schwanfield to Heidenheim, where, having purchased a wild spot of ground covered with shrubs and bushes, he cleared it and built first little cells or mean cottages for himself and his monks, and shortly after erected a monastery. A nunnery was founded by him in the neighbourhood, which St. Walburga governed. The idolaters often attempted the life of St. Winebald by poison and by open violence: but by the divine protection he escaped their snares, and continued by his zealous labours to extend on every side the pale of Christ’s fold. He was solicitous in the first place to maintain in his religious community the perfect spirit of their holy state, teaching them above all things to persevere instant in prayer, 3 and to keep inviolably in mind the humility of our Lord, and his meekness and holy conversation, as the standard from which they were never to turn their eyes. They who find a reluctance arising from the corruption of their passions, must nevertheless force themselves cheerfully to all that which is good, especially to divine love, fraternal compassion, patience when they are despised, meekness, and assiduous prayer; for God, beholding their conflicts and the earnestness of their desires and endeavours, will in the end grant them the true grace of prayer, meekness, and the bowels of mercy, and will fill them with the fruits of the Spirit, in which state the Lord seems to perform all things in them; so sweet do humility, love, meekness, and prayer become. Thus our holy abbot encouraged his spiritual children, and strengthened in them the spirit of Christ; but he inculcated to them both by word and example, that Christ never plants his spirit nor establishes the kingdom of his grace in souls which are not prepared by self-denial, mortification, obedience, simplicity, a life of prayer, and profound humility; for self-elevation is the greatest abasement, and self-abasement is the highest exaltation, honour, and dignity. For only he can cleave to the Lord who has freed his heart from earthly lusts, and disengaged his affections from the covetousness of the world. St. Winebald was afflicted many years with sickness, and had a private chapel erected in his own cell, in which he said mass when he was not able to go to church. Once, being looked upon as brought by his distemper to extremity, and almost to the point of death, he made a visit of devotion to the shrine of St. Boniface, once his spiritual father and much honoured friend in Christ; and in three weeks’ time was restored to his health. Some time after, he relapsed into his former ill state of health, and in his last moments earnestly exhorted his disciples to advance with their whole might towards God without stopping or looking behind them; for no one can be found worthy to enter the holy city, who strives not by doing his utmost that his name be written in heaven with the first-born. For this, in the earnestness of our desires, we ought to pour out tears day and night. Our saint had made them, as it were, the very food of the soul, and having been tried and purified by a lingering sickness as the pure gold in the furnace, went to God on the 18th of December, 760. After his death St. Willibald committed the superintendency over the monastery of monks to the holy abbess St. Walburga so long as she lived. The monastery of Heidenhem was finally dissolved upon the change of religion in the province of Brandenburg Anspach, in which it was situated. 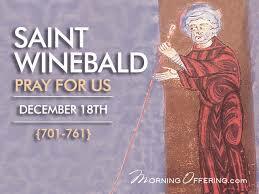 The nun who wrote the life of St. Winebald assures us, that several miraculous cures were performed at his tomb. St. Ludger also writes in the life of St. Gregory of Utrecht, “Winebald was very dear to my master Gregory, and shows by great miracles since his death what he did whilst living.” Rader testifies, that St. Winebald is honoured among the saints in several churches in Germany, though his name is not inserted in the Roman Martyrology, as Mabillon and Basnage remark. See his life, written, not by St. Walburga, as some have said, but by another contemporary nun of her monastery, who had before wrote the life of St. Willibald. In that of St. Winebald we have an account of the manner of canonizing saints in that age, and of the twofold labour to which monks then applied themselves, in tilling land and making that which was wild arable; and in instructing and preaching. This work was published entire by Canisius in his Leotiones Antiquæ, t. 4, more correctly by Mabillon, Act. Ben. t. 4, and most accurately by Basnage in his edition of Canisius in 1725, t. 2, part 2.